Claire Irwin is a native of Corrandulla, Co. Galway. 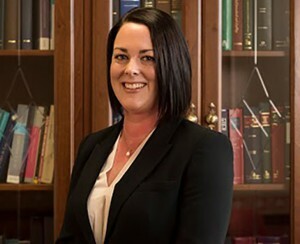 Claire graduated from NUIG with Bachelor of Corporate Law and LL.B degrees and from the University of Wales, Cardiff with an LL.M in Legal Aspects of Medical Practice. She has considerable experience in all aspects of law but her preferred areas of interest lie in Personal Injuries Litigation, Professional Negligence, Family Law, the law relating to children and persons with disabilities. She has a particular expertise in the area of legal aspects of mental and physical incapacity including Wards of Court, Care of the Elderly and applications under the Nursing Homes Legislation.